Minder DVD boxsets don't get better than this set. 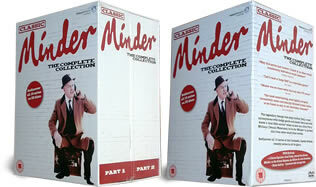 The complete Minder collection on 33 dvd's, complete series from start to finish. 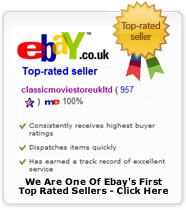 DELIVERED FREE IN THE UK with Super Saver Delivery. Out at last (March 09), the complete box set of one of the best cop series ever. All ten seasons from 1979 to 1994 on 33 dvd's. There have been some great series over the years, but none is greater than Minder. Minder hit tv screens back in 1979 with the opening episode "gunfight at the o.k laundrette". A great bit of tele history that everyone should watch at least once. But be warned this show will hook you!! Thank you for providing an outstanding first class service. Would not hesitate to you use again. A truely wonderful box set with two of the greatest onscreen chemistry acts to ever grace the TV screen. George Cole and Dennis Waterman are superb in this.George cole who plays the part of Arthur Daly is astoundingly brilliant and acts his part as if it came naturally to him. Running in at 5096 minutes on 33 discs this is going to keep on watching for quiet a long time. But it don't end there the box set also comes with a whole host of extras such as five Christmas specials,photo gallery and an interview with George Cole. I cannot fault this box set one bit and at this great price one would be mad not to pick it up. The service is also great on this site, so an added bonus right there. 5 stars. These were bought on behalf of a friend so I cannot comment personally.